Despite having a tiring shift, as much as possible, you would never ever want to be absent from work or school, right? Well, unless you hate the job that you are currently employed in right now, but that should be in another story. You may also want to see career goals if you want something related to that. You know too well that being absent has a lot of consequences, such as having a backlog of work that will be too difficult to handle once it forms a massive pile and obviously and most especially, a deduction from your total salary for the month. You may also like welcome note examples. A lot of emergency situations can happen within the year. And since it is an “emergency,” it means that there is no way that you would learn about it as soon as you get hired. Important functions, family events, reunions, occasional sickness, and other things might happen unexpectedly which makes having a perfect and clean attendance at work nearly impossible. You may also see note templates & examples. There are companies or schools that, once you would commit even at least a single absence, would constitute to harsh consequences and in order to avoid any of it, employees and students would then secure an excuse note or an excuse for short. You may also check out what is a note. What Is an Excuse Note? 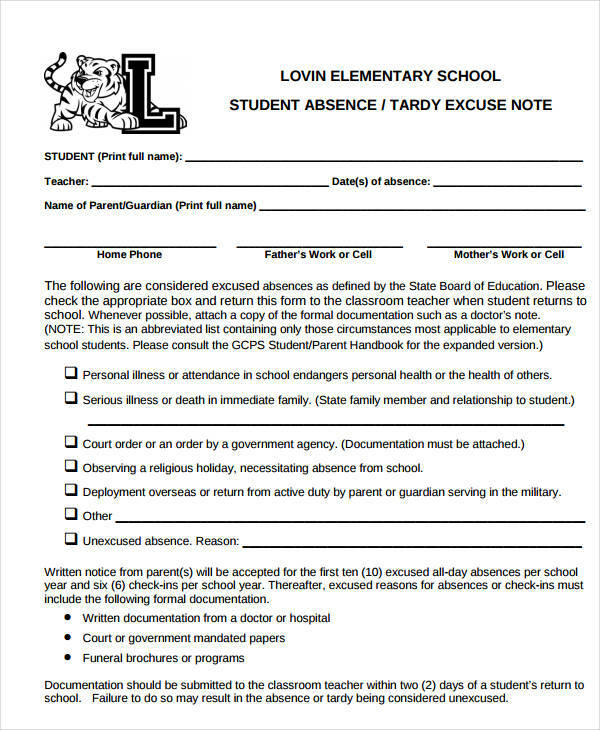 An excuse note is a kind of document that is commonly sent by employees and students to their employer or teacher, respectively, where they would be able to explain their absence. Excuse note could be sent to the other party as a way of asking permission from them before you would miss work or class for the next day. 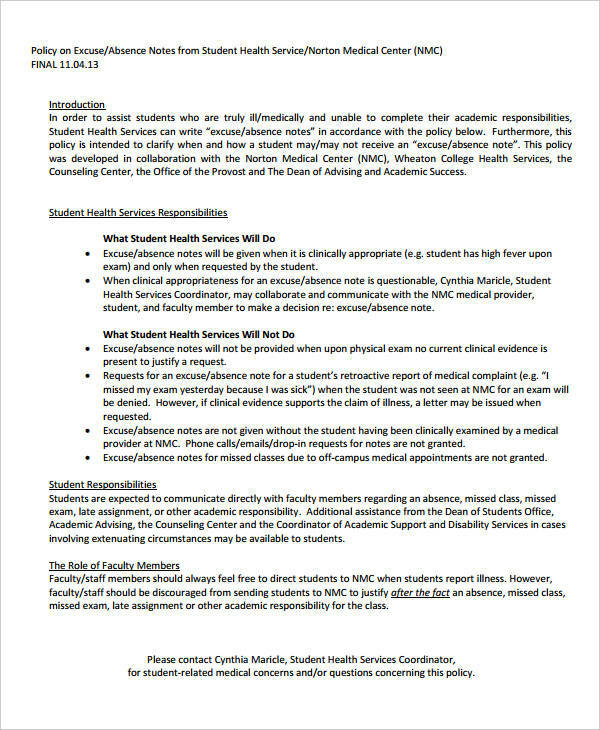 You may also like nursing note examples. While the validity of excuse notes may vary depending on the company you are working in or the school you are enrolled in, it will still be best if you would know and even master how to write one. And with that, we have here eight examples of excuse letter, for both students and employees, that can help you to get started with writing an excuse note. We have also provided some relevant tips you can use when you would finally be writing and editing your excuse note. You may also see note examples in PDF. 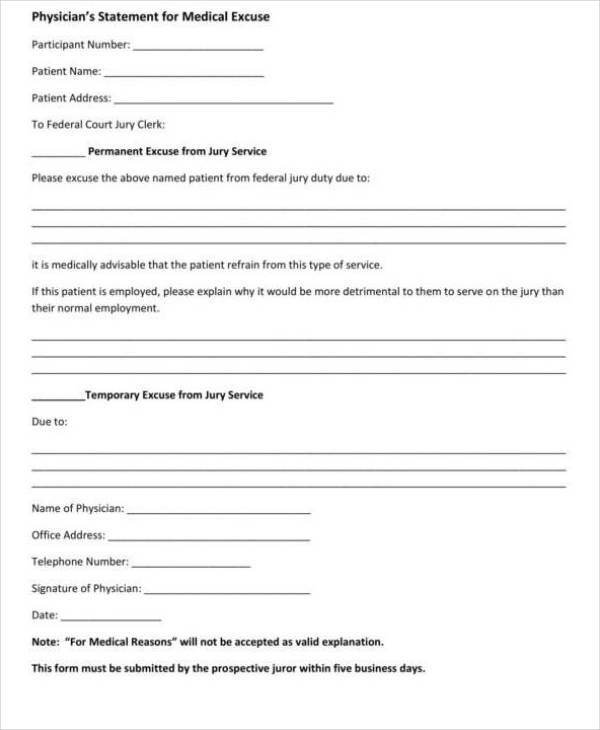 Make sure that before you would go to bed, you have already prepared all the necessary documents that will get you excused for your absence such as a medical certificate or whatever certification you need as proof that your absence is indeed valid. And of course, do not forget your excuse note. You may also check out these field note templates. Especially if the reason for your absence is illness, you must make sure that you will get a good sleep the night before you go back to work or school. Your body should be well rested so that you will not be absent again for another day. After a day or days of absence, make sure that you will get back to work or school early the next day. Being early for work will also be advantageous for you if your company or school policy requires you to meet someone first and file your excuse note. Once you get excused for your absence, you may already know that you have a backlog to catch up to but just take it easy so that your body and mind-set will properly rewire back to your job routine. Hurrying things might make you and your output ineffective, so it is just best if you would take things easy until you can get back easily to your usual routine. Excuse notes are oftentimes considered as excuse letters and should you write one, make sure that you would use a business letter format. This only means that your excuse letter or excuse note is also considered as a formal document. 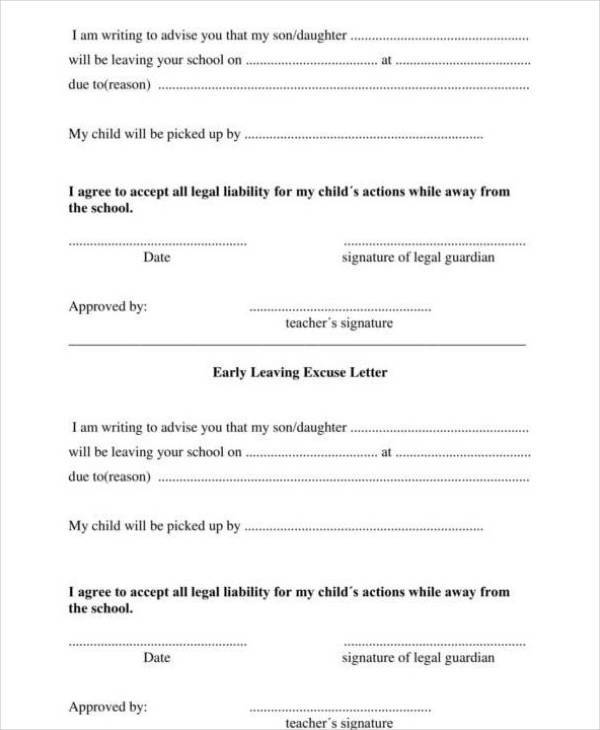 If you are intent on making your absence to become official to your teacher or employer, then you have to make sure that your excuse note is being expressed and presented in a professional manner. You may also check out blank note examples. 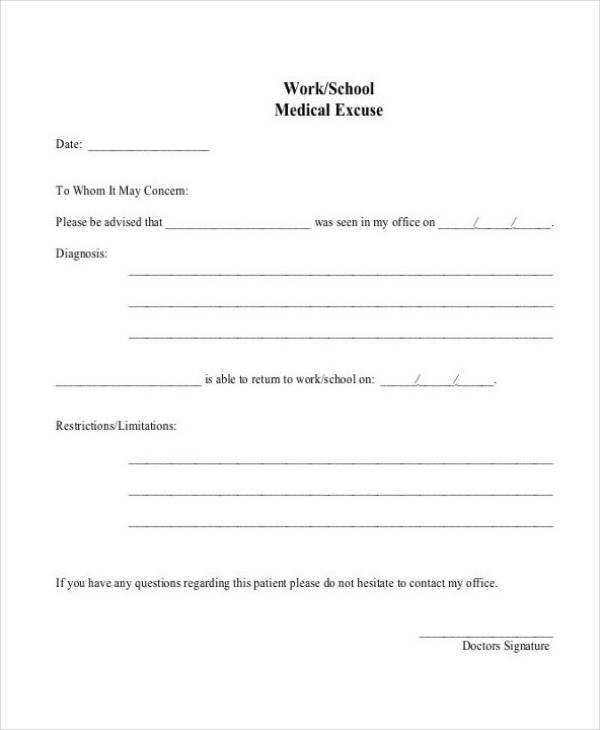 In the workplace setting, employees are usually required to hand in their excuse note before missing their job unless if it is really an emergency. In order to know when you should be handing in your excuse note, make sure that you have already read and understood the policies of the workplace or of the school. The reason behind handing your excuse note in advance is that it can help the business or the company to cope up for your absence most especially if you play a certain important role in it. You may also see meeting note examples. It is important that you should be able to understand the attendance policies in your workplace or in your school because it really varies. There are some workplaces that would allow their employees to just hand in their excuse note even if the employer’s reason is not an emergency at all and there are also some schools and other workplaces where students and employees can just excuse themselves via a phone call or email. 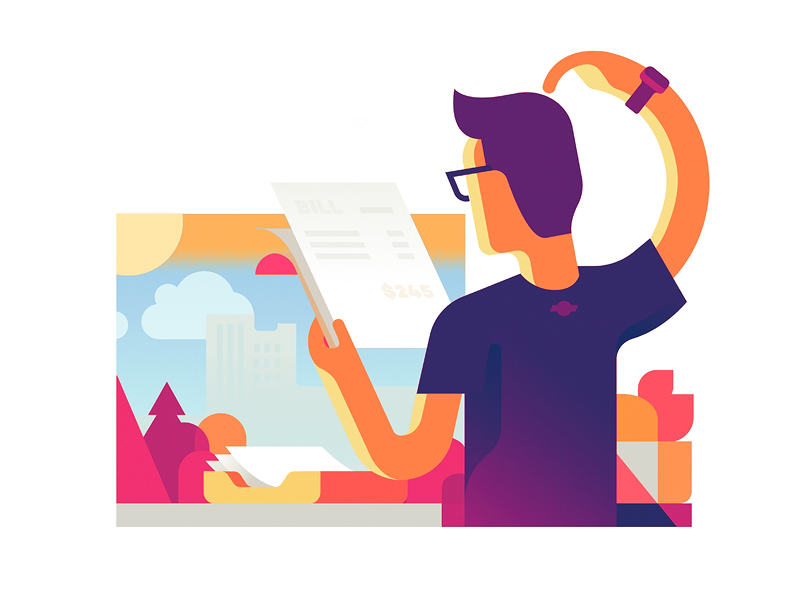 Policies may really vary, and if you are not aware of it, then you should really start getting yourself acquainted with it now. Your excuse note does not have to be very long so that your reason for your absence is “reasonable.” Do not waste your teachers’ or your employer’s time by making them read a very long excuse note that contains your sob, sympathy-seeking story of why you were absent or why you will be absent no matter how your reason has really affected you emotionally. You really do not have to add flowery words just to be convincing because you will be suspicious as a result. Just be direct to the point and do not overexplain your side. State your reasons as brief as possible without compromising anything. You may also be interested in Personalized Journal Examples – PDF. Possessing these three characteristics on your excuse note shows respect to your teachers or your employer. Your excuse note will most likely get considered especially if you show sincerity, politeness, and humility on your letter. Having these three characteristics of your letter will show that you are professional enough and that you know how to be accountable for your actions. 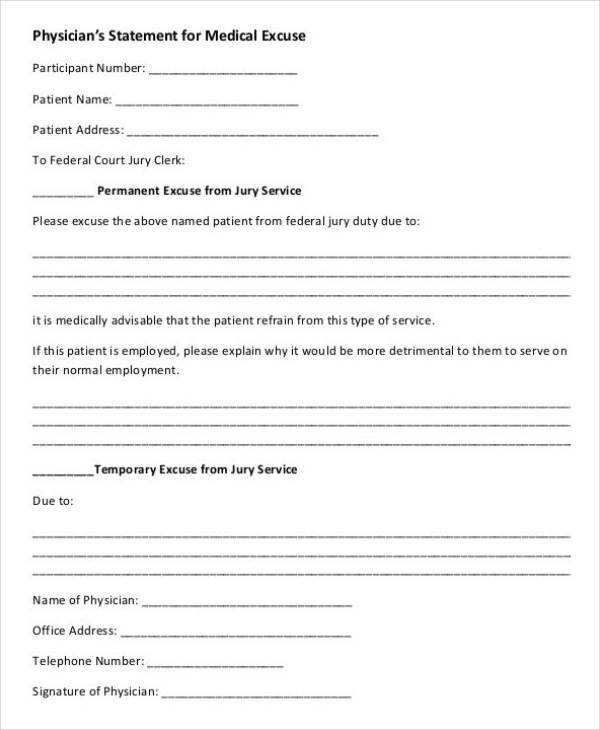 Prerequisite to that, you have to make sure that extra care has been done in the creation of your excuse note. Make sure that you keep the paper where you are going to print your excuse note clean and that you use the formal and complete name of the person you have offended because of your absence. Even if it is as simple as an excuse note, having these characteristics applied will simply show that you are a mature and professional individual even in simple things like this. It goes to show that when greater and graver things will come, you will also be mature and professional enough to handle it. You may also want to create a thank-you note. An additional consequence that has not been mentioned in the introduction is the fact that you will be able to become an inconvenience to other people because of your absence. Even if your absence is excused, make sure that you will make it up for what you have missed due to your absence. But still, even without the assurance of your absence, always make sure that you will hand in your excuse note. You may also want to get more examples of note in PDF. What Is a Briefing Note? How Do You Write a SOAP Note?